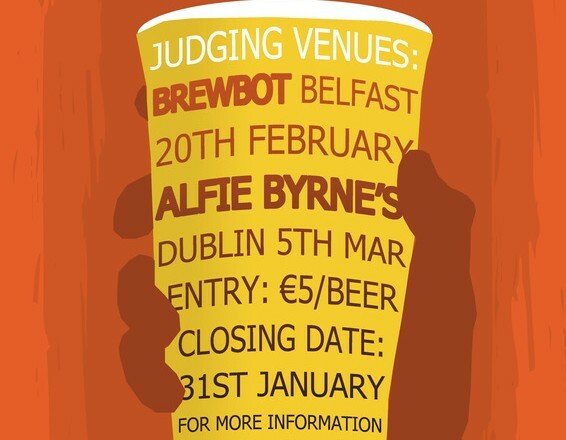 This competition is open to any full member of the National Homebrew Club. Judging will be based on the 2015 BJCP Guidelines. Entries must be registered by Jan 31st. Brewers may enter each category, but are limited to only one entry per subcategory. All entries will be picked up from drop-off locations shortly after the entry deadline (Check below for details). Places will be awarded to 1st, 2nd, and 3rd place in each category or category combination. Score sheets will either be scanned and emailed or returned after the awards ceremony – awards will be available after the ceremony concludes. Score sheets not picked up will be emailed back to participants. Results will be posted to the competition web site after the ceremony concludes. Bottles will not be returned to entrants. Entry Fees: €5.00 per entry. Beer & Cider entries must be 2 x 500ml Brown crown capped or swing-top bottles regardless of strength. Wine entries must be 1 x 750ml bottle. Mead can be 1 x 330ml or 1 x 500ml bottles. Corked or swing-top bottles are acceptable and must be void of all identifying information, including labels and embossing. Printed caps are allowed, but must be blacked out completely. Brown glass bottles are preferred; however, green and clear glass will be accepted. Completed entry forms and recipe sheets must be submitted with all entries, and can be printed directly from this website. Please fill out the entry forms completely. Be meticulous about noting any special ingredients that must be specified. Failure to note such ingredients may impact the judges’ scoring of your entry.